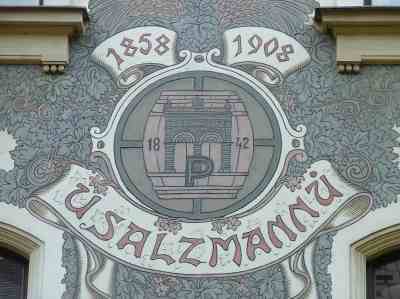 If you’ve come to Plzeň for its history as the birthplace of modern beer, Pivnice U Salzmannů beer hall is a good place to continue the theme. 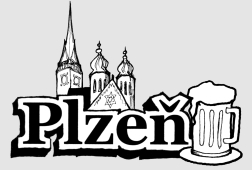 Plzeň’s oldest beer hall, it has been serving meals, sheltering travellers and quenching thirsts since 1637. Halfway along one of the streets leading away from Plzeň’s main square towards the river, U Salzmannů occupies one of the typical old four storey buildings. The street level is painted green and cream and the upper floors are white and decorated with the flowery beer hall logo in muted green and gold. The upper floors of U Salzmannů are used as accommodation and the rooms of various standards and sizes are available for quite reasonable prices considering the location and historic value of the building. Double rooms and apartments with private bathroom facilities go for 1500-1900Kč per night, rooms without private bathroom facilities are 700-900Kč for a double and from 550Kč per person for a single, breakfast included. 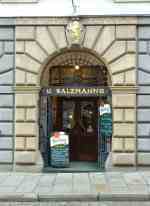 The beer hall interior is a classic old school Czech pub. Two sets of swinging doors with brass handles lead in from the street, then signs point left towards hotel reception and the main part of the beer hall is around to the right. 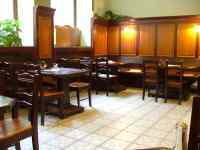 The waiters and barman dress in their black and whites and are quick to bring the menu which is in Czech, English and German. The Traditional Czech Kitchen section includes Goulash, Fried Pork cutlet, roast duck, rabbit, and something called the mayor's plate, which has pork and smoked meats, spicy sausage, pickled cabbage and three types of dumplings. The dishes that most caught my eye in the Specialties section were the Chicken fillet with local mushrooms and gratinated zucchini, the 300gram Rib eye steak (of Uruguayan beef ) in herb butter, and the Pork in bacon with dark plum sauce.